TUCSON, Ariz. (June 26, 2007) - LED lighting from EcoLEDs.com is taking part in a week-long exploration of eco-friendly, green living design ideas for maximum sustainability in housing. The World House Project is a physical display of home design concepts for green living and is part of the annual World House Interdesign 2007, a gathering of design experts of various backgrounds, countries and interests to explore various design innovations in conservation, revitalization, sustainability and capacity. The 36-year-old conference, held June 24-30, 2007 in Toronto, showcases the latest in sustainable housing designs. 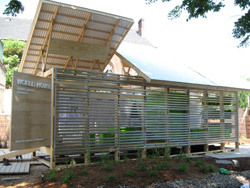 The World House Project explores different construction methodologies that demonstrate material conservation while integrating various building materials including earth, renewable resources and post consumer products. This year's conference theme is "Global Challenges to Sustainable Housing and Water." "We are impressed with the environmental and energy benefits of these LED lighting products," said Richard MacIntosh, an engineer with the World House Project. "Our team identifies and designs low cost, effective energy solutions for the home that maintain quality and comfort, yet minimize ecological footprints. We chose EcoLEDs to help promote this energy-efficient technology to the public," he said.